Pallekele cricket ground is recently stadium. There's no international scene other than a mud strike ground at Pallekele, but they organized world cup 2011 matches. The stadium has been renamed as the Muttiah Muralitharan International Cricket Stadium. In July 2010, The Central Provincial Council in Kandy generally made the renaming assessment to honor the renowned Sri Lankan cricketer Muttiah Muralitharan. With a competence of 35,000 the Pallekele International Stadium in Kandy was recognized in the year 2009. One of the latest stadiums in Sri Lanka, this ground was particularly built to restore the Asgiriya Stadium which prearranged Test matches from 1983 to 2007. Pallekele planned its first Test in 2010, played between Sri Lanka and Pakistan, next which ODIs were hosted from the 2011 ICC Cricket World Cup. Along with the home ground for the Sri Lankan nationalized side, it also hosts the Kandurata home team. 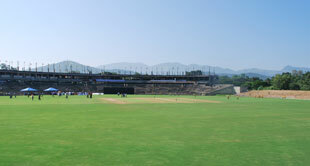 The stadium is also one of the grounds to arrange matches from the 2012 ICC World Twenty20. It was at this very location that Sri Lanka’s Suranga Lakmal tied the likes of Kapil Dev and Imran Khan in becoming the third bowler to get a Test wicket off the first ball at a new location. The stadium has been renamed as the Muttiah Muralitharan International Cricket Stadium. In July 2010, The Central Provincial Council in Kandy unanimously made the renaming decision to honor the legendary Sri Lankan cricketer Muttiah Muralitharan. Muttiah Muralitharan International Cricket Stadium became the 104 Test venue in the world in December 2010. The first Test was played between Sri Lanka and the West Indies from 1–5 December.